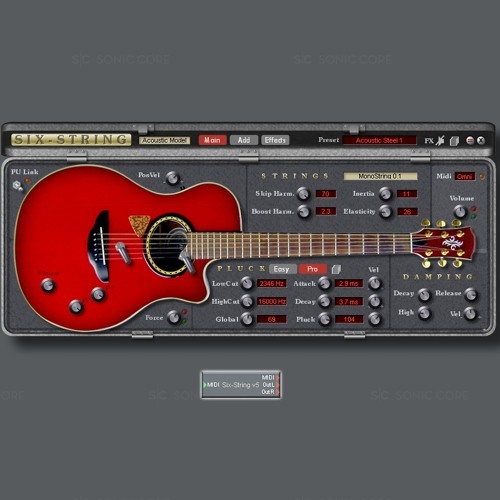 A short demo tune created with seven instances of Sonic Core's Six-String plug-in for Scope. @shogun-spy: Yep, just a little bit of SC-Ambience on a couple of sounds to blend and a mix of my own custom patches, factory patches and Alfonso's patches. Seriously is this all six string ? If so wow! @hitfoundry: This sound is Alfonso's first preset in his Six-String presets bank called Allan's Pad. @hitfoundry: This is where the Kurzweil Expressionmate ribbon comes in handy. Nice e-Bow type FX here, lovely. Excellant use of pitch bend to get that David Gilmour Slide Guitar sound. I gotta use that ! !